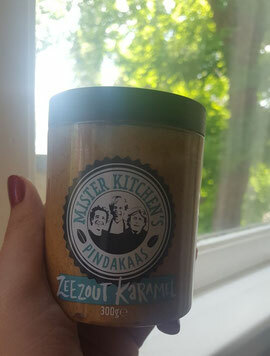 Today I will write a review about Mister Kitchen's Pindakaas (peanut butter). 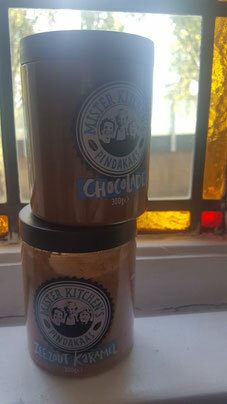 I bought the flavours Peanut butter Chocolate and Peanut butter Sea salt-caramel. I tried the Peanut butter Super Crunch last week, but I find that it does not really have a distinguishing taste. Any peanut butter brand with crunch will do. First I tried the Peanut butter chocolate on a corn cracker. This flavour costs € 2,99 for 300 grams. The flavour is a bit disappointing. I expected a bit more chocolatey flavour but the peanut butter is predominant. All by all, it tastes pretty nice but it is not impressive..
Secondly I tried the Peanut butter Sea Salt Caramel. This flavour also costs € 2,99 for 300 grams. 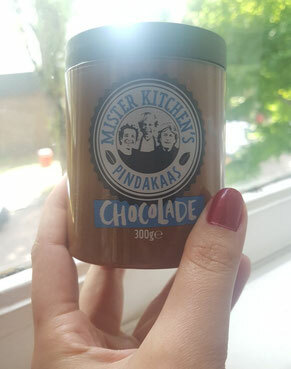 I did not have high expectations after the Peanut butter Chocolate butttttt this flavour is delicious!! The sea Salt has a crunchy feeling to it which I loveeee. I highly recommend the Sea Salt Caramel if you love a little bit of a kick. If you are a chocolate lover, mixing regular peanut butter with chocolate paste (NUTELLA) will do just fine.